Very small structures, much smaller than the human eye can see, often fall in the size range of nanometers. By understanding how the molecules that make up these structures interact, we can engineer them to do many special things that cannot be done at a larger scale. 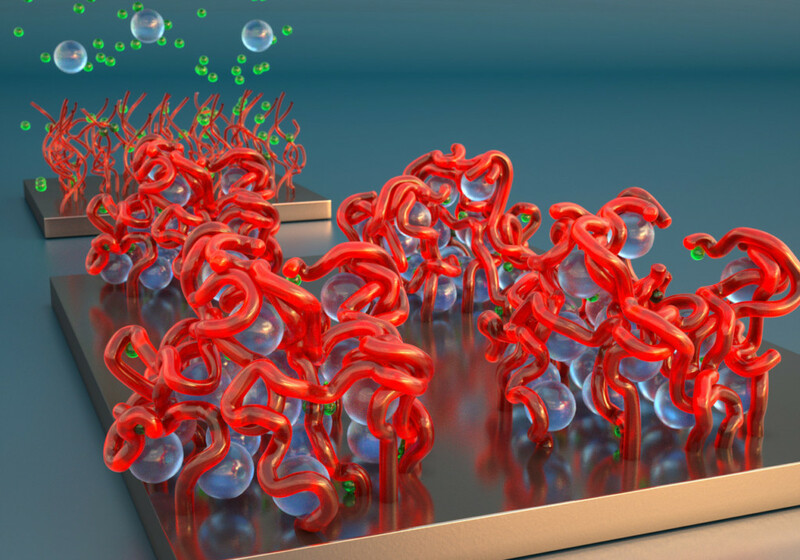 One exciting structure is a polymer brush, in which long, chain-like molecules called polymers are tethered at one end to a surface and stick up from the surface like bristles on a hairbrush. Polymer brushes can be used to keep bacteria away, provide an exceptionally smooth surface for items to slide across, or trap other molecules in solution like a hairbrush traps loose hair. In order to engineer polymer brushes that will perform as desired for a given application, we must understand the physics of how the molecular bristles move, and the chemistry of how they interact with their environment.